When all the candidates for local offices come out unanimously in favor of the same measure, regardless of political affiliation, then you get a pretty good sense that people believe in the rightness of community broadband. As Comcast rolled out seemingly endless slick mailers, robo-calls and full-page ads, broadband advocates kept fighting until the last vote was cast. There was definitely a feeling that the democratic process was being tested in Longmont, and its citizens weren’t about to fail this test. Know who’s funding these efforts to kill pro-community broadband ballot measures, who their allies are and what their real agenda’s are. Generally, it’s pretty simple. The main big incumbent is the usually the puppet master hiding behind the curtain pulling the strings. Some state or regional telco “trade association” is usually the front for the incumbent, the entity of public record that sends out checks and the creator of the astroturf group that pretends to be a local public interest group (Look Before We Leap). Add in a couple of PR firms, some “research experts” and a handful of lawyers, you have the whole of your opposition. Once you expose this cast of characters and their rabid fixation with killing anything with even the hint of competition to the incumbent, many local folks will get on the pro-community broadband train and will stay for the duration of the campaign. As Longmont proved, this loyalty will hold firm through the worst blizzard of negative marketing. 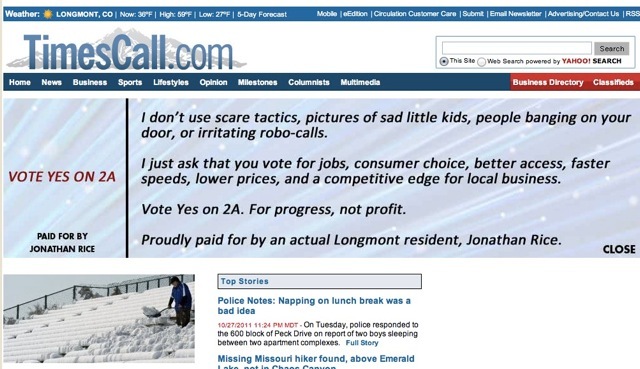 When Longmont held an election on a similar ballot measure in 2009, a lot of people didn’t fully understand what broadband is, what benefits it delivers and how successful these networks have been in other communities. When the half-truths and outright lies start flooding the environment, the facts are your strongest weapons. Supporters went out of their way to deliver “just the facts, ma’am” at every opportunity. Philadelphia, Wilson, NC and now Longmont are among the ranks of communities that have used social networks, blogs, traditional e-mail and other online tools to mobilize constituents quickly to write letters, attend council meetings, show up at events and otherwise stay actively engaged. In a presentation I did last year that I sent over to 2A supporters, I advise setting up a rapid response mechanism for counterattacking opponents’ false claims. It warmed my heart to see supporters create and distribute a news release within hours of newspapers hitting the street with full-page ads from opponents. Just one of the many examples of the small but nimble home team working in excellent guerrilla marketing mode. 2A supporters called on my colleagues Jim Baller (Baller Herbst), Chris Mitchell (Institute for Local Self Reliance) and others as well as myself. We open our vaults of knowledge of broadband and political battles across the U.S. so local advocates can be knowledgeable, creative and resourceful during referendum campaigns. It also helped a lot having Alcatel-Lucent on board as an ally. Even though their financial contribution was small ($3,500), their presence lends credibility to the campaign plus access to good (and free) knowledgebases. After patiently enduring weeks of four-color glossy brochures dumped in every mailbox that attempted to scare voters, one Longmont resident saved up his pennies and ran the following ad on the local newspaper’s front page in the last couple days of the election. It summed up community sentiment quite nicely. Of course there are additional lessons. But I’m not going to give away all the inside secrets. There are many more battles to fight. Outstanding article Craig and thank you for your support on this issue. Longmont citizen’s have truly won the day. Now, let’s see what the city can do with this new found asset. Thanks for your encouragement, wisdom and support in this battle, Craig. And thank you for conveying the true spirit of the “Yes on 2A” grass roots effort. Longmont voters remembered 2009, are weary with large corporations pushing them around, and in this case, trying to push their buttons on this issue. It’s a beautiful thing to witness the Citizens of Longmont speaking loudly on Election Day! On behalf of Iowa’s nearly 30 very successful municipal telecommunications utilities, congratulations on your community’s victory! You’re on your way to helping Longmont take control of your technology future. I think the Times-Call newspaper helped make a big difference this time over the failed referendum in 2009 by calling the “opposition” by its rightful name — Comcast and the Colorado Cable Assn. We were late getting into this battle, but it took literally minutes to dig into the so-called independent groups opposed to Longmont’s referendum and find Big Cable money as far as the eye can see. From the direct infusion of cash into the opposition campaign to the dollar-a-holler research used to “prove” their case, this was a classic astroturf dog and pony show and the people of Longmont weren’t buying it. “[The opposition] relied heavily on a highly-suspect 2006 case study by University of Denver professor Ron Rizzuto that claimed 80 percent of community-owned Wi-Fi broadband networks failed to make money. But the group didn’t make any distinction between Wi-Fi and fiber optics, and more importantly they left out the fact Rizzuto was inducted into the Cable TV Pioneers in 2004 for service to the cable industry. Rizutto’s “study” was a classic case of dollar-a-holler research on behalf of the New Millennium Research Council, a creature of the telecommunications industry. we support you and look forward to helping you provide access to all at affordable rates.